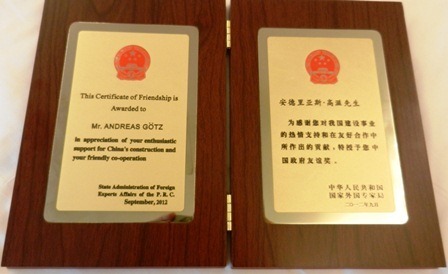 Andreas Götz, Vice Director of the Federal Office for the Environment FOEN, was honored with the Chinese government’s Friendship Award in Beijing. Premier Wen Jiabao presented the Award, which consists of a medal and a certificate, the highest honor awarded to foreign experts who contribute to the economic and social development of China. Mr. Götz did valuable work through the promotion of near-natural hydraulic engineering in China and also contributed to the improvement of flood prevention. Andreas Götz has been collaborating with swissnex China several times over the past few years. Last time we were honored to have him as a guest speaker for our swissnex China Lecture on “Climate Change and Risk Management”. Good cooperation has existed between Switzerland and China for several years in the areas of environmental protection, water management and natural hazard prevention. Switzerland is involved an intensive exchange on water management and the management of natural disasters with the Chinese Ministry of Water Resources. This cooperation is based on a formal agreement concluded between the Swiss Department for the Environment, Transport, Energy and Communication and the Chinese Ministry of Water Resources.